U.S. wind operators self-propelled and staging ports” and can carry and install 8 ket: “No offshore projects for now. It’s special interest should ? oating wind take unpropelled jack-ups, the latter for “the MW turbines. AK Suda and GustoMSC a market where we see potential in the projects succeed farther out into the U.S. more risk-averse.” might represent the bulk of U.S. wind- next few years. It’s an important market 200-mile limit, as is envisioned. European. 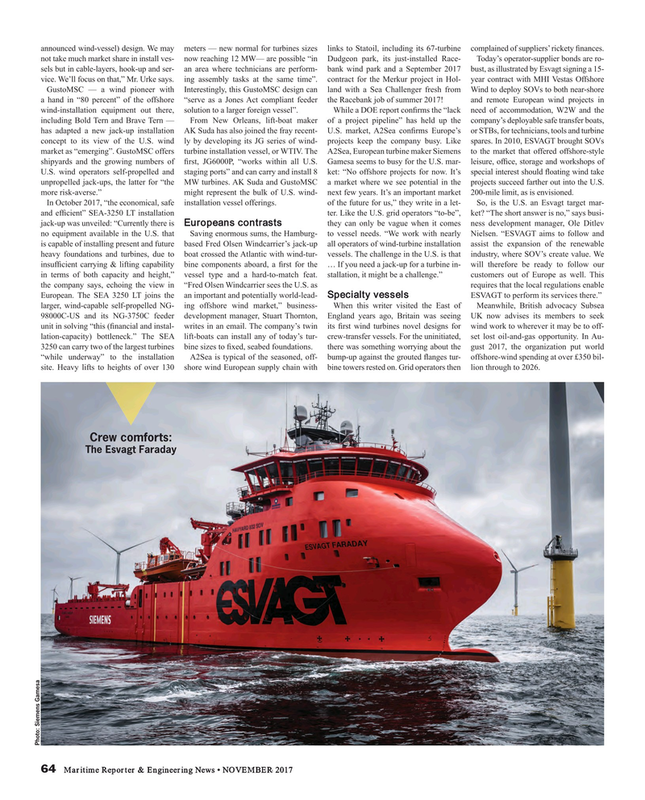 The SEA 3250 LT joins the an important and potentially world-lead- ESVAGT to perform its services there.” Specialty vessels larger, wind-capable self-propelled NG- ing offshore wind market,” business- When this writer visited the East of Meanwhile, British advocacy Subsea 98000C-US and its NG-3750C feeder development manager, Stuart Thornton, England years ago, Britain was seeing UK now advises its members to seek unit in solving “this (? nancial and instal- writes in an email. The company’s twin its ? rst wind turbines novel designs for wind work to wherever it may be to off- lation-capacity) bottleneck.” The SEA lift-boats can install any of today’s tur- crew-transfer vessels. For the uninitiated, set lost oil-and-gas opportunity. In Au- 3250 can carry two of the largest turbines bine sizes to ? xed, seabed foundations. there was something worrying about the gust 2017, the organization put world “while underway” to the installation A2Sea is typical of the seasoned, off- bump-up against the grouted ? anges tur- offshore-wind spending at over £350 bil- site. Heavy lifts to heights of over 130 shore wind European supply chain with bine towers rested on. Grid operators then lion through to 2026.